These small FX cymbals are a fun bag of Marmite items which may or may not suit your taste and purpose. Between them they produce a wide range of trashy, ringy add-on sounds. Great for trashy and ringy sounds. Interesting variety. Relatively affordable. Not all tones will suit your playing. For 2015 Zildjian has expanded its range of FX effects creations with these five items. 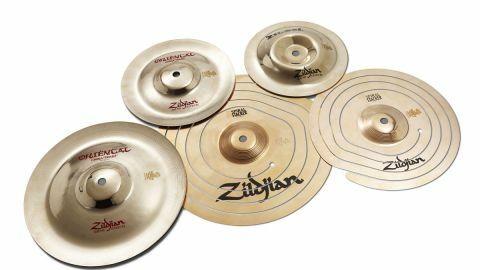 They are smaller versions of similar types which already feature in the Zildjian inventory. Effects cymbals are big business these days as cymbal companies strive to broaden the palette of acoustic players in the face of digital jiggery-pokery and e-kit popularity. The Oriental China Trashes and Zil-Bel are made from Zildjian's B20 bronze alloy. The Chinas are thin with squared bells and upturned edges, whereas the Zil-Bel is much thicker with a 'volcano' profi le cup. They all can be mounted either way up and used singly or combined with other cymbals for unique hybrid effects. The FX Spiral Stackers - the clue is in the name - really require stacking. If they are not supported on another surface they unravel and drop down alarmingly. We assume they are made from sheet bronze alloy. There would be no point in using expensively cast B20 and then cutting it up into a spiral. We sat the 10" and 12" FX Spiral Stackers atop a couple of large rides. The ride sound is immediately foreshortened, ruined! Striking the Stackers in various places produces assorted hissy commotions. They're quite heavy and floppy, but potentially fairly dramatic. If you crash the cymbal when the Stacker's on there, there is a splintering smash followed by a long rippling sieve-like rattling. Like when you put a chain on a ride, but multiplied tenfold. Impressively nasty! You won't want to put it on your most prized ride, but sat on any cymbal it gives you several options. You can ride the bigger cymbal itself for an abruptly harsh ride sound. Not really like a china, but more garbage-y. Then when you strike the spiral itself you get more of the hiss and it jumps about making firecracker effects, visually quite appealing too. We did try the stackers on their own (like Zildjian's larger Spiral Trashes), when they unravel and droop precariously, becoming a sort of sound sculpture reminiscent of a Matt Nolan creation. The result is a soft, delicate silvery percussive sound which could be handy in a very quiet setting. Run your sticks down it like a wind chime and it jumps around like a jack-in-the-box. This way you can keep it going to produce a delicate continuous jumpy fizz. The 10" and 12" Oriental China Trashes are versatile, with at least three distinct sounds - a tanking rounded short 'doink' of a bell, a clean central stick-tip 'ting', and a sharp trashy edge crash. Mounted either way up they are distinctive, potentially musical and attention grabbing. The bigger 12" one has a more Oriental flavour, the smaller one recalls the fabled dinner bell. These Orientals work well as stackers too. Mounted upside down on top of a ride or crash gives you another sound palette. They don't interfere too much with the sound of the ride or crash, but when you strike the Oriental it produces its range of tones but offset, amplified, invigorated and enlarged by the sound of the crash or ride too… like early Bill Stewart. Mounted the 'right' way up on top of a cymbal it does now interfere more with the sound, but creates a kind of hybrid. You lose the bell of the bigger cymbal while the bell on the Oriental is now pretty useless - a dead tink. But you still get an interesting compound sound, though flatter and thicker toned. Finally there's the 7½" FX Volcano Zil-Bel, which is much thicker than the Orientals and thus delivers a soft and pure ping. In fact there are several different tones depending on where and how you strike it and with what - stick or beater, etc. Caught forcibly on the edge it is surprisingly plangent and loud. The ridge of the bell has a much shorter, harder and dingier tone. In the interests of completeness we tried the Zil-Bel as a stacker too, mounted upsidedown on top of a ride. It again foreshortened the ride and made an interesting composite tone. And if you then whack it on the edge, the amplified bell sound is deafening.